"Final Cut Pro 4 for Mac OS X: Visual Quickpro Guide"
Final Cut Pro veterans are mostly thrilled by FCP 4, Apple's latest release. What's not to love? All the real time you can eat, those cute little keyframe editors in the Timeline, adjustable track heights; everybody has their pet feature, even if nobody can locate Bruce the Wonder Yak's new hiding place. FCP 4's new clip handling scheme, however, is mildly baffling even to long-time users. It's important that current users wrap their heads around the New Way of Doing Clips in FCP; that's why I selected this excerpt ripped from my soon-to-be-real book, "Final Cut Pro 4 for Mac OS X: Visual Quickpro Guide"
Final Cut Pro has always used clip types - audio, video, graphic, and generated - to identify clips that reference different types of source media. FCP uses a different class of clip types -s ubclip, merged clip, and sequence - to identify clips that reference a portion of another clip (like a subclip) or multiple clips (like merged clips and sequences). FCP 4 has added three new clip types - master, affiliate, and independent-to identify clips that are linked by shared properties (like master and affiliate clips) or clips whose properties and behavior are independent of other clips (like independent clips). The new clip type classifications and behavior are designed to ease media management by automatically updating all affiliated clips when you make a change to a shared property on any of the individual affiliates anywhere in the project. The master/affiliate clips' shared properties are all related to media management; clip properties that remain independent - In and Out points, markers, and applied effects - are all modified during the normal course of editing and must remain independent in each clip copy you use. Here's an example: You have a master clip in the Browser, and you edit it into your sequence. An affiliate copy of that master clip appears in the sequence. Rename the affiliate copy, and the name of its master clip is also renamed. Change the reel name of the master clip, and the reel name of the affiliate clip in the sequence reflects the same change. The master/affiliate clip-handling scheme keeps your clip duplicates in sync, which can simplify your life when you're media-managing certain types of projects. Projects best suited to master/affiliate clip handling are well logged, with discrete clips that you don't plan on subdividing much. If your preferred editing method is to capture large chunks of media and then subdivide and rename the clips post-capture, consider converting your master clips to independent-type clips before you start dicing them up. It could save you from the headache and confusion of converting (and tracking) each clip's type separately. For more information on clip affiliation protocols, see "About Clip Affiliations" in Vol. I, Chapter 9, of Apple's Final Cut Pro 4 User's Manual. Audio, Video, and Graphics clip: These clip types are determined by the type of source media the clip is referencing. Generated clip: Create a generated clip by opening a generator from the Viewer's Generators pop-up menu. Generated clips are created as master-type clips. For more information, see Chapter 17, "Titles and Generators." Master clip (Figure 4.51): Any clip that can generate affiliate clip copies is a master clip. See Table 4.1 for a complete list of ways to create one. 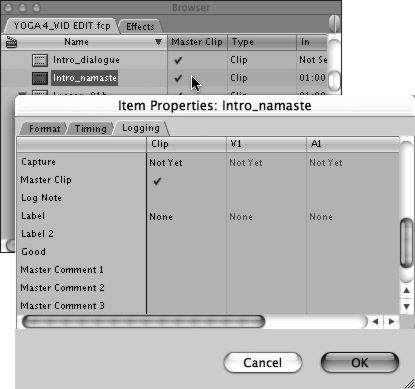 Figure 4.51 It's not easy to identify master, affiliate, and independent clips in the FCP interface. Master clips are easiest to spot; a checkmark in the Master Clip column identifies a master clip in the Browser and on the Logging tab of the clip's Item Properties window. Master clips never appear in a sequence. Affiliate clip (Figure 4.52): An affiliate clip is a copy of a master clip that is created by inserting the master clip into a sequence or duplicating the master clip in the Browser. Copies of affiliate clips remain linked to their master clip originals; the linked relationship extends to the clip name, reel name, source timecode, labels, subclip limits, and online/ offline state of all affiliate clips. Change one of these shared properties in any one of the affiliated clips, and the change will appear in all the affiliated clips. Markers, In and Out points, and applied effects or motion properties remain independent in master/affiliate clips. See Table 4.1 for a complete list of ways to create an affiliate clip. Figure 4.52 Affiliate clips have no checkmark in the Browser's Master Clip column. In a sequence, the only way to identify an affiliate clip is to open the clip's shortcut menu. If the Make Independent Clip command is available and not dimmed, the clip is an affiliate clip. Independent clip (Figure 4.53): Each copy of an independent clip refers directly back to its source media and does not synchronize clip naming or any other properties with any other independent clip copy. All clips in pre-FCP 4 projects are independent clips. See Table 4.1 for a complete list of ways to create an independent clip. 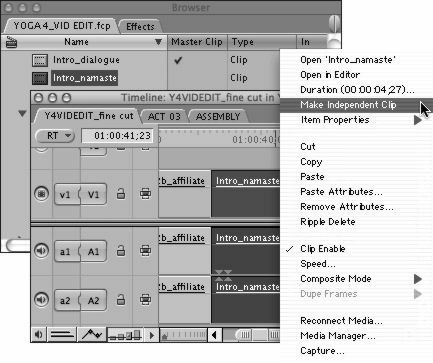 Figure 4.53 In a sequence, you can identify an independent clip by opening the clip's shortcut menu. If the Make Independent Clip command is dimmed, the clip is already an independent clip. Independent clips appear in the Browser only when you open a pre-FCP 4 project file. Merged clip: Create a merged clip by combining video and audio from sepa-rate sources into a single clip. Merged clips are always created as master-type clips. For more information, see "Working with Merged Clips," later in this chapter. Subclip: Subclips are shorter clips you create from a section of a longer master clip. A subclip is always created as a new master-type clip, with no affiliate relationship to the clip it was created from. For information on subclips, see Chapter 8, "Working with Clips in the Viewer." Capture new video or audio. Drag a merged clip from the sequence back to the Browser. Import an EDL or batch list. Use the Duplicate as New Master clip command. 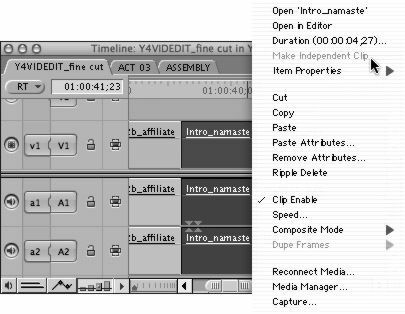 Use Modify > Make Master Clip on an affiliate or independent sequence clip. Delete an affiliate's master clip. Affiliate clips in the Browser are converted to master clips. Synchronizes clip name, reel name, source timecode, labels, subclip limits, and online/offline state with all affiliate clips. Does not synchronize markers, In and Out points, applied effects, or motion properties. Master clips appear only in the Browser. Edit a master clip into a sequence. Duplicate a clip in the Browser or in a sequence. Copy and paste a clip in the Browser or in a sequence. Drag a sequence clip back into the Browser. Synchronizes clip name, reel name, source timecode, subclip limits, and online/offline state with all affiliated clips and the master clip. Affiliate clips can appear in the Browser or Timeline. Delete an affiliate's master clip. Use the Make Independent Clip command on a sequence clip. Copy a sequence from Project A to Project B; sequence clips become independent in Project B.
Edit a clip opened outside the project directly into a sequence. Open a FCP 3 project in FCP 4; all project clips will be independent. Maintains independent clip name, reel name, source timecode, remove subclip limits, online/offline state, markers, In and Out points, and applied effects or motion properties. Independent clips appear only in the Timeline, except when a pre-FCP 4 project is opened. A clip is the basic unit of media in Final Cut Pro. A clip can represent a movie, still image, nested sequence, generator, or audio file. A clip is a reference to the actual media file stored on your hard disk. But a clip can also reference material that is not currently online. If you delete the original media file, the clip will still appear in the Browser and Timeline, but you won't see its frames and you won't be able to play it. When you apply special effects and perform edits on clips, you are not affecting the media file on disk. Before FCP 4, all clips were governed by the same clip-handling protocols. FCP 4 uses three clip types: master, affiliate, and independent. Master and affiliate clips use one set of behavior protocols; independent clip behavior is governed by a different set of rules. When you insert a master clip from a project into a sequence, FCP inserts a copy of the master clip, known as an affiliate clip. That affiliate copy in the sequence shares certain properties with the master clip but maintains independent control over other properties. This protocol is important to understand because it affects how and where you should make changes to master/affiliate clips, and it illuminates what's different about independent clip behavior. So, let's lay out the rules. The change you make is applied to all affiliated clips in the project. It doesn't matter if you make the change to the master clip or its affiliate; the result is the same. Master and affiliate clips' shared property behavior only applies within a single project; your changes will not be applied to other projects. You can open the clip from the Browser (outside a sequence) or from the Timeline (within a sequence). If you make changes to the clip in the Browser and then insert that clip into a sequence, the clip copy that is placed in the sequence includes the changes that have been made in the Browser. Any changes you make to a clip from within a sequence are not made to the clip in the Browser. After you've inserted a clip into a sequence, any further changes you make to that clip from the Browser will not be reflected in any sequence where the clip is used. Clips that appear in multiple sequences are independent of one another. Changes to one will not affect the others. If you want to make further revisions to a clip that's already in a sequence, open the clip from the Timeline and then make the changes. If you want to make changes to a clip and have the changes show up in all the sequences in which that clip is used, open the clip from the Browser and make the changes. Then reinsert the revised clip into each sequence in which you want the updated clip to appear. Final Cut Pro identifies clips that have been opened from the Timeline by displaying two lines of dots in the Scrubber bar. No dots appear in the Scrubber bar of clips that have been opened from the Browser. When you convert an affiliate-type sequence clip to an independent-type clip, that independent clip refers directly back to the source media file on the disk, and any clip property can be modified independently from any master or affiliate clip referencing the same source media file. Because each independent clip copy maintains independent control over all its properties, the same rules that apply to the In and Out points of master and affiliate clips (listed above) apply to all properties of independent clips. Excerpted from pages 139-144 from the book, FINAL CUT PRO 4 MAC OS X: VISUAL QUICKPRO GUIDE by Lisa Brenneis, Reproduced by permission of Pearson Education, Inc. Publishing as Peachpit Press. ALL RIGHTS RESERVED.